There are many factors that go into a team's successful run for the title; and, of course, luck plays a big role in putting together a string of victories. Stability and continuity have been shown to be an important contributing factor, and some results from the Football ERA bear that out. No matter how stable a situation, talent plays another key role as well of course. And in today's NFL, the free agent market dictates that a team constantly replenish its talent and keep searching for more as free agency and salary cap demands constant change that necessitates constant replenishment and reevaluation of talent. Great front offices and organizations compliment great coaching as well. 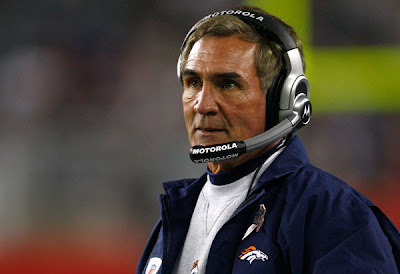 And great coaching is another key factor for success in today's competitive NFL where it is clearly seen that anyone can win week to week or win the Super Bowl by putting together a sudden run in the playoffs. Both New England and Denver reflect many of these factors---particularly stability, an eye for replenishing great talent, and great coaching and preparation. 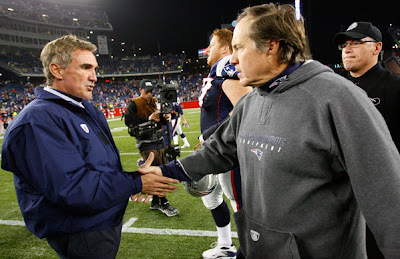 New England has managed to get to the Super Bowl many times in the new "free agent era", and great coaching has played a part in their success. Denver has not had the same kind of success as to be be given the term "dynasty" as it is increasingly hard to be considered in today's NFL. But they are one of a handful of NFL franchises that are successful at constantly rebuilding in a short period of time. It doesnt hurt that to do this as other teams with this type of ability have all had stable front office and coaching personel during their downturns. Tennessee, Pittsburgh, Jacksonville, and Baltimore all come immediately to mind in the AFC---but the last few seasons, Denver has shown remarkable resiliency in rebuilding over and over every year. On the other hand, this has made it difficult to be successful on defense as defense requires on the field experience that takes time to incubate above and beyond execution in practice which can help an offense develop quickly. 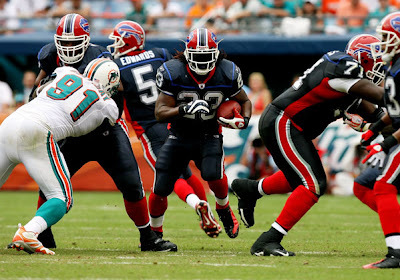 The Football ERA has helped provide insights into much of the on-field success and demise of many team's performances in 2008. 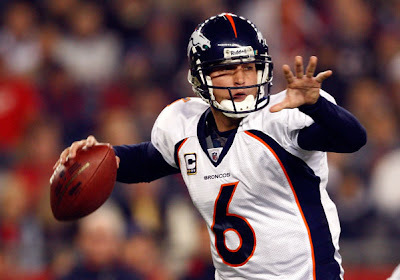 One thing I couldnt predict is how well the Denver Broncos would do so early in the season given that they have entirely built their offense and defense from the offensive line and the defensive front. The fact that it takes longer to develop the experience that leads to great defensive execution on that side of the ball, Denver has suffered from up and down performances in terms of its win/loss record from week to week. 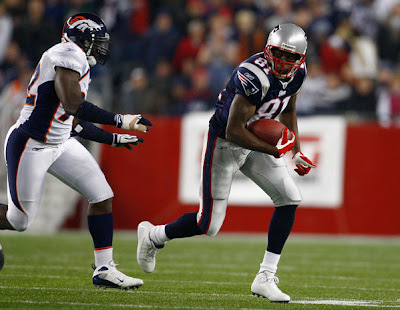 And their performance in New England is a good example of this as the Patriots showed up with focus and intensity from a week of practice that manifested itself in a performance that showed their determination to keep their season from slipping into an abyss in which their detractors were painting them to be falling. The Denver Broncos went through another rebuilding process on both sides of the ball this offseason. 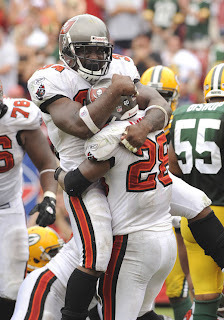 They went into the 2008 season opener against the Raiders with a completely new offensive line and defensive front. It didn't hurt to open up the season with an easier schedule as they gelled as a unit in their execution--particularly on offense. Their defense also performed well but has been up and down more recently as their schedule got tougher, and they faced off against tougher opponents. Defense generally takes longer to develop, and the Broncos have yet to show great patience from year to year in building off their previous unit. Gone from the defensive line are lineman Sam Adams, Amon Gordon, and Simeon Rice among others. Also out of football is former LB Ian Gold. Gone from the offensive line are Matt Lepsis, Chris Meyers, Montrae Holland are gone with Tom Nalen and Erik Pears on the injured reserve list. Center Chris Meyers now starts for Houston, and Guard Montrae Holland is a Dallas Cowboy. Great coaching and preparation have played a major factor in Denver's early season success on offense as they have undergone wholesale changes on both the offensive and defensive line. On offense they are starting a third year lineman in Guard Chris Kuper, a second year lineman in Right Tackle Ryan Harris, and a Rookie Left Tackle in Ryan Clady. In addition, former Kansas City Chief, free agent acquisition Center Casey Wiegmann has been starting at center for the injured Center Tom Nalen who is still on IR. New England has struggled in 2008 in generating any kind of defensive pressure and consistency before Week 7's Monday Night matchup thus far this season. Despite having a lot of continuity and stability in their starting lineups (with the exception of Tom Brady and injuries in their Running Back corps), they haven't gotten into a groove--much like the beginning season slump seen in both New Orleans and San Diego last season. 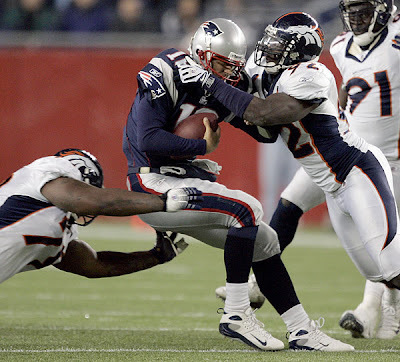 It went almost unnoticed that New England successfully rushed the ball against the Broncos on Monday Night with a virtual unknown starting at Right Tackle--Matt Levoir--for the injured RT Nick Kaczur. The reason why cumulative results are not to be viewed as a Power Rankings is evident as the 2008 seasons heads well into October. There are new teams emerging and developing as teams who we thought were going to go the distance with the same lineup are struggling with injuries and bringing backups up to speed-----they aren't who we thought they were. I run several spreadsheets looking for changes in how teams are rising and falling in the cumulative standings. First Derivative change is how we can distinguish emerging teams from those that are falling off a bit from week to week. As St. Louis begins to develop their rushing attack, we can see them rise in the rankings eventhough their cumulative score towards the bottom of the rankings. Dallas loses ground, and Tennessee rises--pushing Kansas City lower. Changes in the rankings are significant and reveal why these rankings are NOT a Power Rankings. Washington has been making steady progress in developing continuity and consistent play out of their offensive and defensive lines every week since their opening season loss to the Giants. 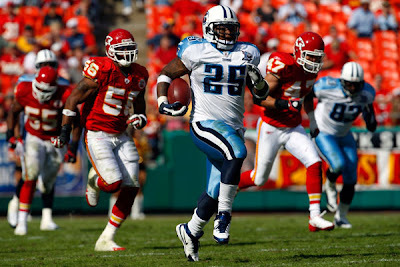 This trend continued in Week 6 as they came out and dominated at the line of scrimmage versus the St Louis Rams as reflected in the result of their Football ERA score. 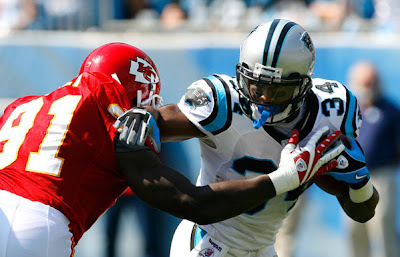 However, many of their long drives down the field ended in costly fumbles that ultimately cost them the game. Morever, dominating the line of scrimmage by running the ball has the effect of lowering points scored versus ball control. The Redskins kicked field goals instead of scoring touchdowns and slowed the clock down by holding the ball and getting 1st downs. 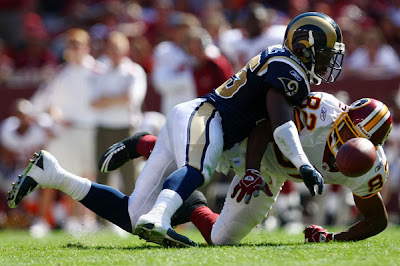 This left them vulnerable on the scoreboard to blowing the game on turnovers, and a final drive by the Rams cost Washington the victory. The Football ERA does not calculate for turnovers, broken plays, special teams, and open field plays that ultimately decide the outcome of many football games. 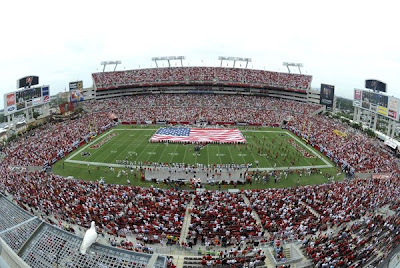 It does allow us, however; by design, to look away from the scoreboard and the win/loss record to get a unique perspective as to how teams played week to week in between the lines of the end zones on any given Sunday. 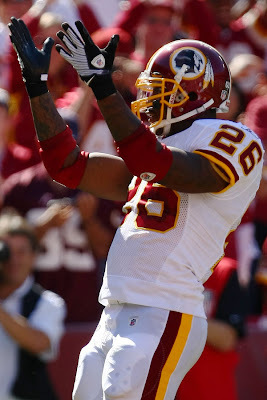 Despite getting another new head coach from owner Dan Snyder and yet another new offense to learn in 2008, the Redskins have benefited from stability and continuity in their lineup from 2007. As the offense has practiced and executed the offense from week to week since their season opening loss to the Giants, their offensive production has improved and increased from week to week. Experienced veteran OT Jon Janson stepped in for the injured OT Stephon Heyer in Week 4, and the line hasn't missed a beat. On defense, OLB Marcus Washington has been in and out of the lineup with injuries with LB H.B. Blades filling in for him in various weeks. LB Washington returned to the lineup against St. Louis. Also DE Demetric Evans has filled in for DE Jason Taylor as part of the Defensive Line rotation while Taylor was nursing a calf injury. 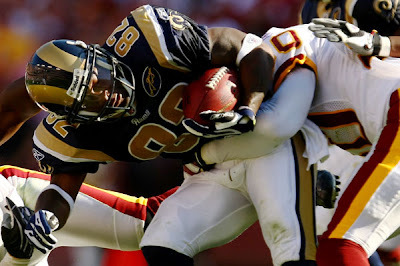 The St Louis Rams suffered from a tremendous amount of adversity in 2007 (see September Post "Seattle Bounces Back against the Rams". Adversity can, however, help to build depth by giving valuable experience to backups. 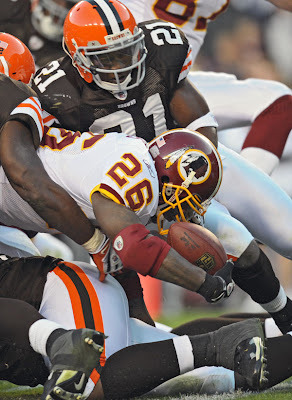 Some of those backups became regular starters and have been struggling to gain a foothold on the 2008 season. But with hard work and practice, week by week improvement eventually can become apparent. 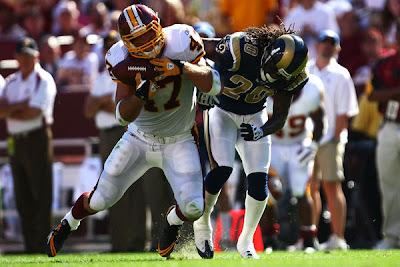 The same Rams that lost in Week 1 are not the same Rams that won in Week 6 over the Redskins. The Rams have been attempting to run the ball better in recent weeks (like against Buffalo), and those efforts eventually returned dividends in a much needed win. Whereas offensive left guard Jacob Bell returned to the lineup in Week 4, the defense, on the other hand, has had numerous shuffles in their starting lineup. For various reasons including health, the defensive line has rotated Leonard Little, James Hall, Victor Adeyanju at defensive end, and La'Roi Glover and Clifton Ryan at defensive tackle while LB Chris Draft has been substituted in the lineup for LB Quinton Culberson. The reason why cumulative results are not to be viewed as a Power Rankings is evident as the 2008 seasons heads well into October. There are new teams emerging and developing as teams who we thought were going to go the distance with the same lineup are struggling with injuries and bringing backups up to speed-----they aren't who we thought they were. I run several spreadsheets looking for changes in how teams are rising and falling in the cumulative standings. First Derivative change is how we can distinguish emerging teams from those that are falling off a bit from week to week. As Cleveland emerged this week to battle the defending Super Bowl Giants at the Line of Scrimmage, they pushed the Giants down in their Football ERA results as they begin to rise relative to other team's respective Football ERA results. 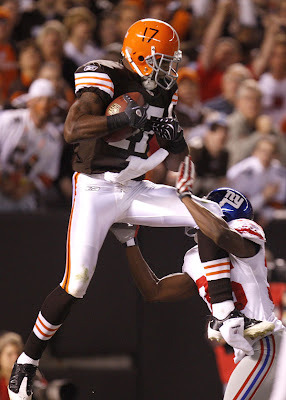 Football games are most often decided by open-field or broken plays like those on big plays, special teams, and returns after turnovers. This game epitomized that, and the Football ERA essentially doesn't calculate for these type of plays; and, therefore is not an ultimate predictor of outcomes. (I'd be in Vegas if it were...). In this vein, open-field plays could be viewed loosely as "unearned runs" with respect to the Football ERA--not, to quote Seinfeld, that there is anything wrong with that. In fact, most would look at the turnover column after games as a predictor of who won in many instances. Teams do practice, however, to try and establish the line of scrimmage and ultimately put pressure on the defense and break big plays....as do defenses try to break an offense with defensive pressure. The Football ERA trys to give insight into this aspect of a team's performance so that we may judge a team's prowess not just on final scores and win/loss records. Close spreads in the final calculation of the Football ERA indicate even matchups and not winners---as was the case in this game. Just by looking at the Game Breakdown from the Game by Game results shows that New Orleans both attempted to establish the run and apply defensive pressure. 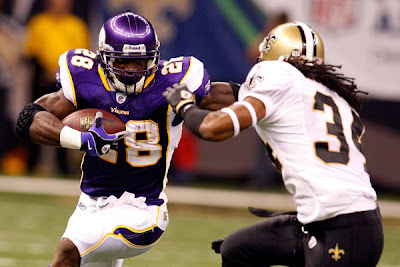 Whereas the Saints drove the ball with some success, the Vikings were nearly equal to New Orleans in rushing and in applying defensive pressure as the game came down to final field goals. 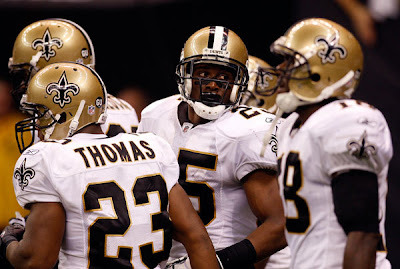 Under Head Coach Sean Payton, the New Orlean Saints have had its share of stability and continuity in its lineup. Much like the San Diego Chargers, however, they did not gain their edge in the winning games until the 2nd half of the season in 2007. Defensive consistency has been an issue, but so far this year, the Saints seem to be making strides as of late in getting a more balanced contribution from their defense as well as their offense. The league is very competitive, however, and wins are hard to come by whether it be a conference game or a divisional foe. The success of their offense can be tied to the starting offensive line the past two seasons, but that line was broken up by the loss of Center Jeff Faine to Tampa Bay in free agency. His replacement, OL Jonathan Goodwin, got plenty of valuable experience filling in when he was absent with injuries the past few seasons--and has been up to the challenge so far in 2008. The only other issues the Saints have faced on their line this season has been the absence of Guard Jamar Nesbit to suspension with Rookie Carl Nicks filling in for him in Weeks 4 and 5. Another Rookie Sedrick Ellis was brought in to bolster the interior defensive line allowing DT Hollis Thomas to be released. DT Kedrick Clancy started alongside Ellis as Antwan Lake was not healthy enough to be in the rotation for at least a couple of their early season contests. 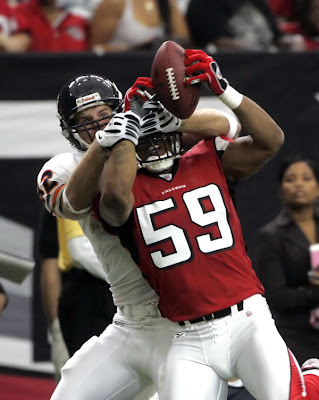 Although LB Brian Simmons is no longer a Saint, free agent LB Jonathan Vilma was acquired from the New York Jets in the offseason. The Linebacking corps missed the contribution of OLB Scott Fujita early in the season due to injuries, but Rookie Jolonn Dunbar filled in for his absence. Changes, as usual, to the starting lineups from 2007 and/or previous weeks in 2008 are highlighted in Bold. Whereas there were no major free agent losses to their starting fronts from 2007, they did make a splash by signing DE Jared Allen from Kansas City. He became a much needed acquisition as DE Kenechi Udeze, tragically, is battling Leukemia. 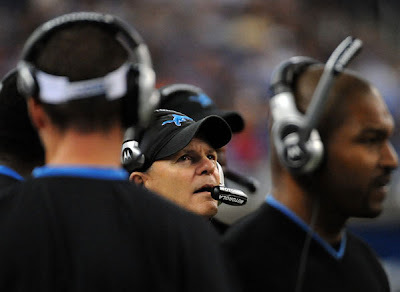 Some have predicted good things for the Vikings this season but they're off to a slow start. 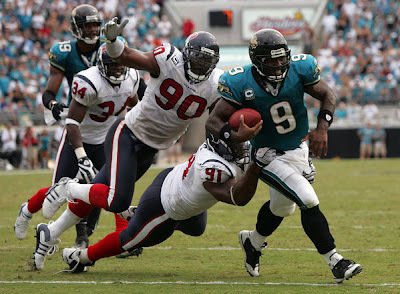 In addition, DE Ray Edwards has battled injuries (replaced by Otis Grigsby in Week 4) as is MLB E.J. Henderson. Also, OT Bryant McKinnie was replaced in the first few weeks of the season by experienced veteran OT Artis Hicks due to League suspension. Its October, and new teams are emerging into their own--after early season struggles. Every month in today's NFL seems like its own season as teams develop and emerge from week to week or struggle with adversity and injury. Analyzing the Football ERA's cumulative results is a little bit tricky, and I generally look at how team's are changing relative to each other as some rise while others fall. This is much more important than looking at their absolute ranking. Once again, I caution that this--by NO Means, is a Power Rankings. 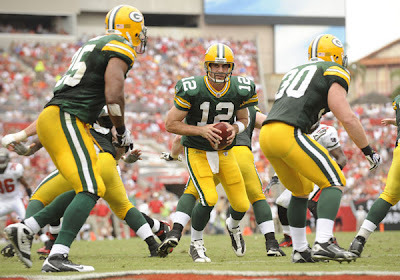 Tampa Bay left no doubt on Sunday as to which team dictated play in its win over the Packers. 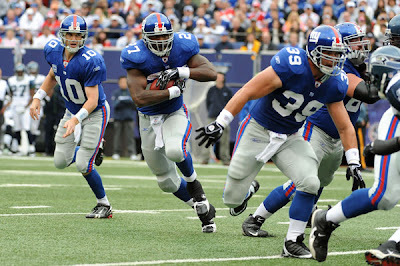 They controlled the line of scrimmage by running the ball and driving the ball down the field. 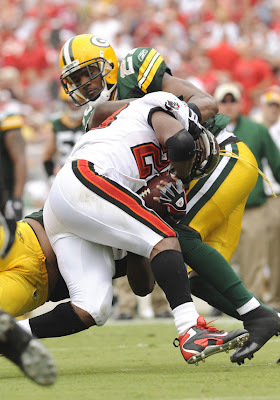 Green Bay struggled to establish any kind of offensive continuity and were not able to stop the Buccaneer offense as they were harassed all day. Both of these teams are benefiting from stability in continuity from last season by bringing back their starters from 2007. Both are having a quality start to their season which is reflected in the fact that they were both playoff teams last year and both retained their coaching staff for the most part. 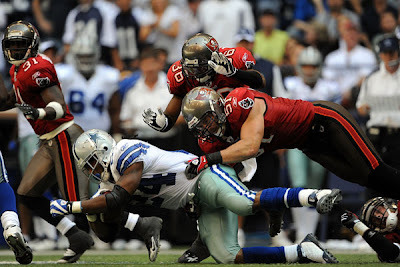 Tampa Bay brings back most of their 2007 defense which was stout enough to help them win their division last year and get into the playoffs where they hosted the New York Giants in the first round. 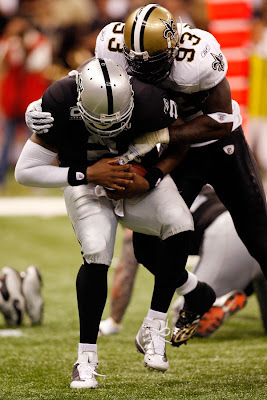 DE Greg Spires was signed by the Oakland Raiders but did not make their August 25th cut. 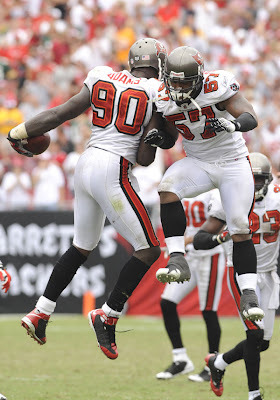 The Bucaneer's were able to let Spires go because they were ready to insert last year's 1st Round Pick DE Gaines Adams into the lineup to bolster their defensive line. LB Derrick Brooks played well on sunday despite playing through a right hamstring injury pulled in the loss to the Saints. Changes in the lineup from 2007 and/or the previous weeks are highlighted in Bold, as usual. Former Buccaneer OT Luke Petitgout is currently a free agent and serving a 4 game drug suspension. 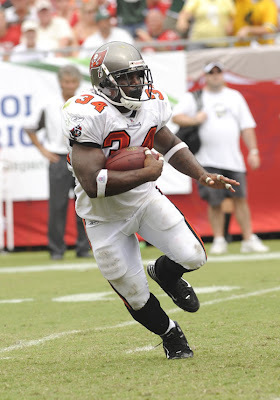 After signing with Tampa Bay as a free agent from the New York Giants in 2007, he was put on IR with a torn ACL after the Week 4 injury. OT Donald Penn filled in admirably and is now the starting left tackle of an offensive line that has provided a potent rushing attack for the Buccaneer offense thus far this season. Center John Wade is now an Oakland Raider, but the Bucs signed C Jeff Faine from New Orleans in the offseason as well as C Sean Mahan from Pittsburgh. Right Guard Davin Joseph has missed the first four games with an injured foot; however, G Jeremy Zuttah has played well in his absence at right guard. 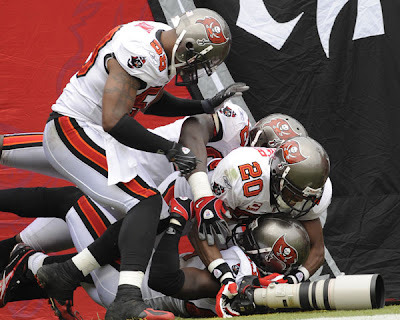 The Buccaneer Offensive Line has benefited from adversity in the last few seasons which has served to build valuable depth that is paying dividends so far in 2008. 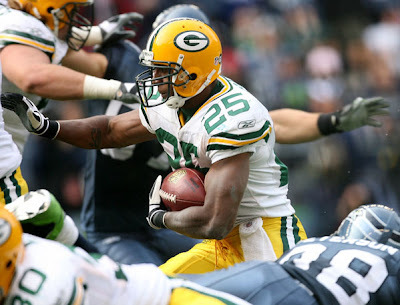 The schedule has not been kind to the Green Bay Packers thus far in 2008, but they have not been without success as football fans everywhere have been tracking QB Aaron Rodgers progress. 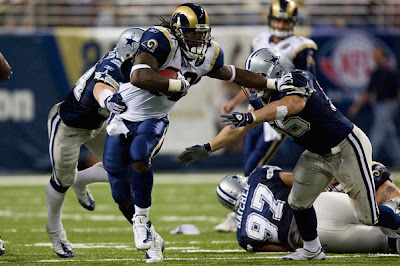 In week 4 LB Brady Poppinga returned to the starting lineup after free agent acquistion Brandon Chillar, formerly of the St Louis Rams, filled in against the Cowboys in Week 3. Chillar was right back on the field sunday filling in for an injured AJ Hawk who started despite battling a chest injury and suffered a groin injury in the first half. On Offense, Center Scott Wells also returned to the lineup who missed most of preseason and the first 3 games with a pinched nerve in his back. OL Jason Spitz who filled in at center was moved back to his right guard spot where backup G Tony Moll had been starting. Moll played well as a result of gaining valuable experience playing for injured starters in 2007.